When you put together efficiency, management skills, integrity, love for the game and players - you get Branko Vučinić. We have followed his unconditional dedication to the Serbian national team for years now, and, his work is nothing but flawless. Overcoming a bundle of obstacles can probably be one of the things on top of the list where he shines. - I had the opportunity to "work" with Branko through almost every national team gathering, whether it was with U19 or with the big team, and I don't even know where to start, or what to highlight out of numerous times I personally witnessed the hustle this guy has shown over the years, his commitment to this game and personal sacrifices he has made to make our time with the national team better. I had to say “work” because even though he was the team manager, I never felt anything but pure kindness and friendship from him even when I was a kid. He is the one guy that understands everyone’s problems, and often goes out of his way to help them. First time we met was at the U19 national team camp in 2010. and I already saw then what kind of the guy he was, from the little things like talking to the chefs getting the meals bigger for the players (or double for the OL), letting us smuggle in some rooms where they had AC between the practices because it was really hot those days. He even went to some guys’ schools at that time and talked to their teachers because they had some bad grades, needless to say, it worked every time. We are talking about the guy who at that time didn’t even know the rules of the game, and has met those players 3 days ago. I could write for a long time about all of the things he’s done that were way out of his official duties, but you got the picture. He is the one single-handledly juggling between players/coaches needs and federation’s possibilities, and only he knows how tough it was, but the team never lacked anything. From all the players that have “worked” with Branko on any occasion, I would like to say a big thank you for everything you have done, and hopefully keep doing for Team Serbia football! - says Mladen Stojanović, national team player/SBB Vukovi Belgrade lineman. 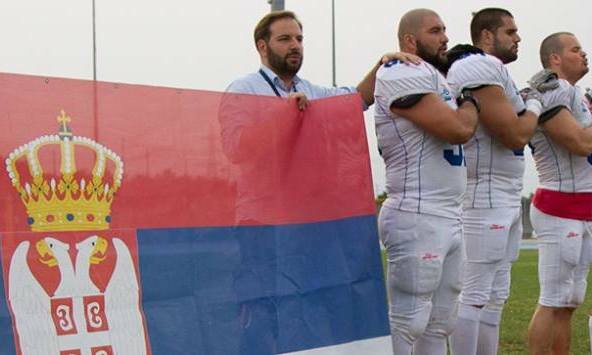 Nikola Davidović, Blue Dragons president/national team lineman - had nothing less to say - Branko is that person who unconditionally gives his all to the Serbian national team for 6 years now. His stubbornness and persistence helped him overcome many obstacles that were in front of our national team, for so many times! National team players have nothing but the utmost respect to The Director, and he has unconditional support from the players. Branko you are a Hero!